At today's EPW hearing, Sen. Boxer helped fellow Senators visualize what 2 million out-of-work construction workers looks like -- 20 Dallas Cowboys stadiums, with 100,000 seats each, packed to the gills. She hopes a new infrastructure bill will help put them back to work. Photo courtesy of the Senate EPW Committee. Business and labor came together to make a rare show of unity today to push for a robust transportation reauthorization with adequate investment for infrastructure. And they spoke out loud and clear for a higher gas tax. Most surprising of all – it seemed that Senators were finally ready to have a mature discussion about it. The gas tax has been a third rail issue lately. While finance and infrastructure experts roundly agree on the need to raise the tax – which hasn’t been increased since 1993 and whose purchasing power has been gutted by inflation and improved fuel efficiency – politicians have been unwilling to get behind a tax hike during a down economy. Enter Tom Donohue and Richard Trumka, two towering figures in U.S. economic life. Donohue, the cantankerous chief of the U.S. Chamber of Commerce, and Trumka, the man’s man who heads the AFL-CIO, don’t agree on much. In fact, a favorite joke of today’s Senate hearing, where the two appeared together, centered on the strange-bedfellow nature of their joint push for infrastructure investment. Carper noted that he was one of the only people on the Hill willing to support a modest increase in the gas tax to pay for infrastructure and deficit reduction. He has suggested raising it a penny a month for 25 months. The deficit commission has moderated that proposal, recommending a penny a quarter for three and a half years (resulting in a 15-cent increase), with all of the revenues going to infrastructure. Carper says that works fine, too. Think about it – a 15-cent increase in three and a half years. I’ve seen three and a half months where we’ve seen gas prices go up – or down – by that much. I’ve seen three and a half weeks – and we all have – where they’ve gone up by that much. So I would ask you, in spirit of ‘the things worth having are worth paying for,’ to keep that in mind and help find a way to make this acceptable to the folks in our country. But in the end, Trumka said none of that will generate the robust funding at the level that’s needed. We must rely on and boost our user fee revenue streams, a key component in addressing our huge infrastructure deficit. The gas tax has not been raised since 1993. It provides diminishing levels of funding and should be raised. Other forms of user fee funding mechanisms such as creating a user fee based on vehicle miles traveled have been discussed. He cautioned that user fees can “have an unfair and disproportionate impact on working people if not properly designed” and threw in a pitch for collective bargaining rights, saying that when people earn a decent living they don’t “squeak” at paying a higher gas tax. Well, sure, you might be thinking – the tax-and-spend liberals in the AFL-CIO might get behind a gas tax but the big-business conservatives of the Chamber of Commerce will never go for it, right? Wrong. 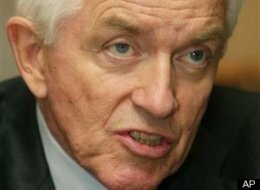 Tom Donohue was president and CEO of the American Trucking Associations for 13 years before going to work for the Chamber. He says back then, California truckers resented paying a user fee that would be used to build roads in Nevada, but he told them, “you have to build roads in Las Vegas or you’ll never get out of California.” These days, truckers are begging for a hike in the diesel tax if it would mean that the country would repair its roads and reduce traffic. The brainstorm continued. Sen. Barbara Boxer asked about a fee on shipping containers entering the country at customs. Donohue shot that one down as fast as he shot down the financial transaction fee idea, saying exporters would find ways around the fee and might slap a tariff on U.S. goods in retaliation. That left Boxer with the stone-cold realization that the answer, really, was the gas tax. Yes, Donohue said. It’s just common sense, “recognizing that you’re collecting half of what you used to.” Boxer added that people driving electric cars aren’t paying anything for the roads, and started mulling the VMT fee. 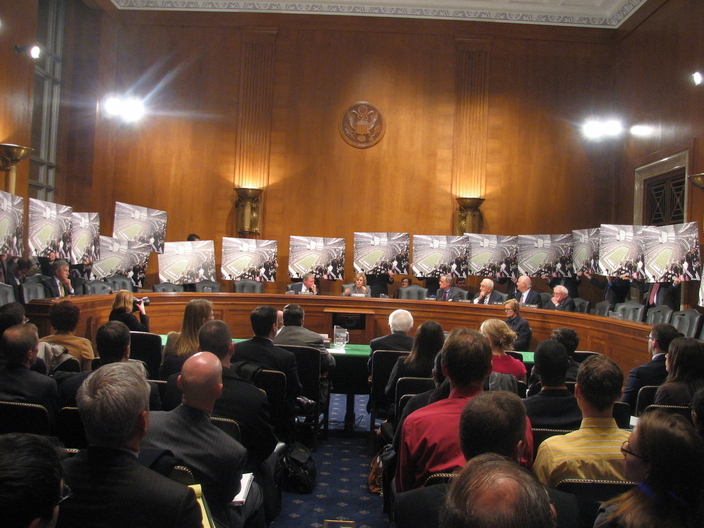 The hearing involved some of the usual bickering over bike lanes and transit – the “hitchhikers” onto a Highway Trust Fund intended just for highways, to hear Ranking Member James Inhofe (R-OK) tell it. Sen. Ben Cardin (D-MD) reminded him that public transportation investment actually creates more jobs than roads and attracts development near transit stops. Trumka and Donohue refused to get dragged into that debate, asserting that roads and rails are both necessary to create jobs, reduce congestion, and build a 21st century infrastructure. But that’s not true. They may not be paying for Interstate highway maintenance, but chances are high that your average electric car owner is or will be paying for local road maintenance in the community they live in, as much of this is funded via the general fund, which in turn is funded via property taxes and other locally collected taxes and fees. This is the same argument that is used against cyclists all the time, and I’m a little alarmed that a US Senator isn’t aware of something as basic as this. Well, electric cars will not be paying for Federal highways, such as the Interstates, if they continue to be funded by gas tax. Although electric cars may be driven mainly on local streets and roads, which are paid by property/sales/other local taxes, they may use federal roads. Bikes, on the other hand, almost never are allowed on federal highways and interstates, so there is no argument there; even state gas tax funding goes largely to freeways and highways, rather than local streets that bikes use. State gas tax funds could be applied to any state-owned piece of road, and your average state has tons of them that are ridable by cyclists. And riding on Interstates is actually permitted in certain cases in the western part of the US, though it’s not the norm. There is an unmentioned piece to this puzzle. River, Great Lakes, and Coastal Transport. Slower, but more economical than rail, they can efficiently move great quantities of goods and materials that are not so time critical, or that can be scheduled ahead of time. They can move large prefabricated/project cargo easily that can’t go on rail cars easily, while shorten the road trip segment. This country is blessed with large river and internal lake system. We can use it to unclog the road and rail chokepoints. I can list 3 areas off the top of my head that can yield quick returns. 1) The rail congestion through Chicago can be reduced or eliminated by using a towboat/train ferry service to get through traffic cargo around the chokepoint via Lake Michigan. Gary, Indiana would stand to gain from a lake port expansion. 2) Regionally, greater usage of the Ohio River, Missouri, and Mississippi river systems and Lake Erie/Ontario for container/semitrailer movement would reduce freight road and rail congestion in the Illinois, Indiana, and Ohio. 3) New England and southern NY state is unusually dependent on trucks for interstate cargo compared to the rest of the US. This is in part due to the lack of a Hudson River freight rail crossing near NY harbor. There is a barge and car float operation that is expanding, but it is limited in scale. An enlarged system to serve the Northeast would drive down the cost of doing business and living in these states. I was surprised to see someone on this website advocating increased use of river transport. We railroad partisans have enough trouble getting the general public (people who usually notice trains only when they have to stop at a grade crossing for a mile-long freight) interested in our favorite mode, now that most towns no longer have an active train station, and local freight and passenger service is mostly a thing of the past. Barges are even more arcane, being feasible only in certain parts of the country; for example, my homeland of Southern California is devoid of navigable inland waters. Even in places with large, all-year rivers, water and weather conditions can make barge service difficult or impossible. Before certain improvements were made, the Missouri River was sometimes said to be “too thick to navigate, too thin to culivate.” In Congress, “Rivers and Harbors Improvements” bills are often decried as major examples of egregious “pork barrel” politics, and the railway companies protest the use of their taxes to help the competition.